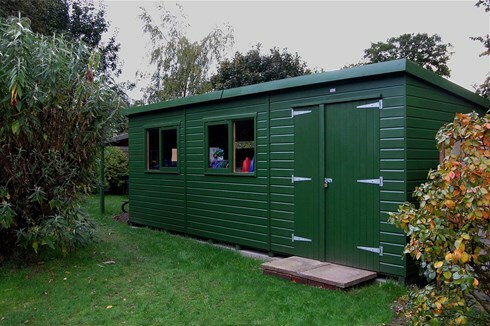 These ruggedly-made timber buildings are called heavy duty workshops because they are used for mobile offices and storage, so they have to be tough! That means they are excellent value where a large-sized shed is needed - for example as secure storage or workshop for large properties and estates, smallholdings, schools, factories, etc. Inside Height To Eaves 6ft 2"
Inside Height To Ridge 7ft 7"
Inside Height High Side 6ft 10"
Inside Height Low Side 6ft 2"